The role of Louis Chevrolet as a co-founder of the Chevrolet Motor Car Company is well-documented. Much less known, however, is Louis’ role in flight – and that there was such a thing as a Chevrolet airplane engine. In the 1920s, Louis began to develop an increased interest in aviation. In 1925, he started attending air shows around the Indianapolis area. A year later, he negotiated with a few Ohio businessmen who were looking to develop a new airplane engine. It was around this time that Louis and brother, Arthur, began delving into the aviation field, thereby starting on the path of creating Chevrolet airplane engines. The Chevrolet brothers formed Chevrolet Brothers Manufacturing Company and completed their very first aircraft engine in the spring of 1927. It was an air-cooled, single-overhead-cam, 4-cylinder engine that was installed in a biplane built by Moundsville Aircraft Corp in West Virginia. Photos of Charles Lindbergh inspecting the engine in that airplane in the summer of 1927 are rumored to be in existence. All seemed well until the plane took off on its maiden flight and was forced to make an emergency landing due to engine trouble. Louis and Arthur Chevrolet has to return to square one, but had a rather heated falling out in 1927, causing them to split up for several years and cease all communication. 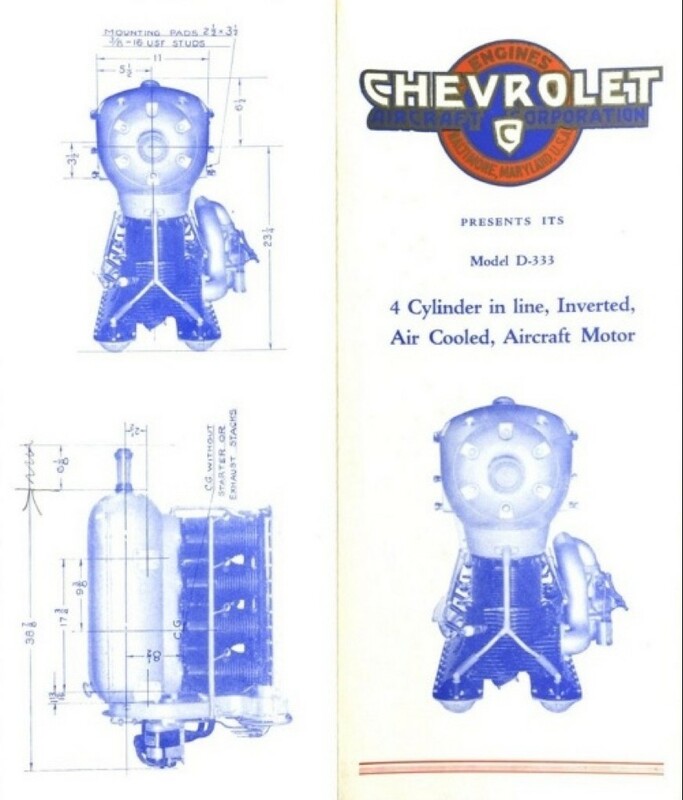 It seems as though the heated argument was caused by the failed design of the first Chevrolet airplane engine. In the spring of 1927, Louis left the Chevrolet Brothers Manufacturing Company and started a new company called the Chevrolet Aircraft Corporation in 1928. He spent the following year developing his new engine with Indy 500 veteran Charles Merz. Meanwhile, Arthur continued working on the old airplane engine design, and photos from that year show a similar engine as the original, but with a double overhead cam instead of a single. Arthur’s modified engine design proved to be yet another unsuccessful feat, and he created a completely new one in 1929 called the Chevolair. each side of the engine. Arthur built a 4-cylinder and 6-cylinder engine in the summer of 1929. 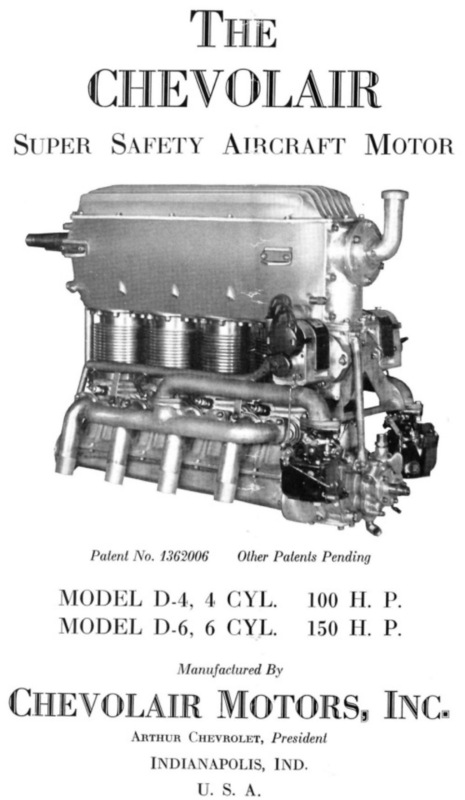 The 6-cylinder was tested by the Bureau of Aeronautics, and received Approved Type Certificate No. 56 in July of 1930. The same engine, however, did not perform well when used by Walter Beech in the Travel Air Mystery Ship for the 1929 National Air Races. Arthur’s 4-cylinder Chevolair engine was used in a Travel Air biplane for a short while. Very few Chevolair engines were made and none are accounted for in the present day. Louis Chevrolet’s new engine closely resembled his younger brother’s design but was not as complicated. 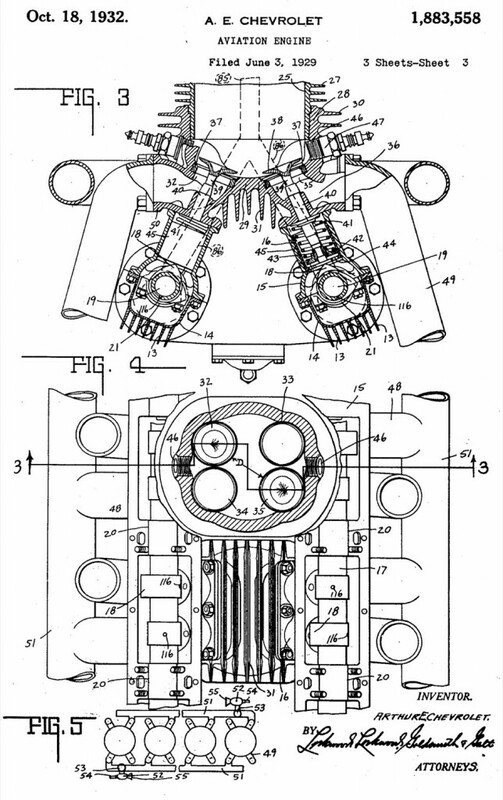 It was an inverted design with the crankshaft on top, and cylinder, heads and valve train on the bottom. Louis patented his engine in the spring of 1929, and moved to Baltimore early the following year. 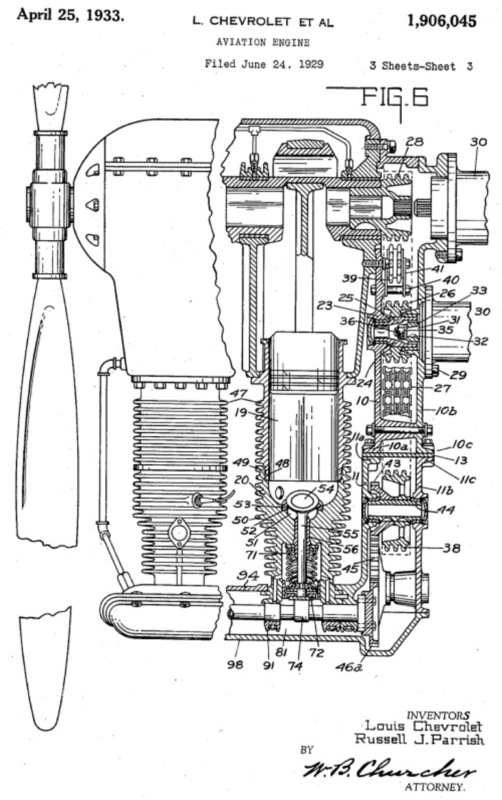 His 4-cylinder, Model D-333 engine earned the Approved Type Certificate No. 59 in 1930. The experimental 6-cylinder engine and Vee configurations were also built. The D-333 4-cylinder engine was installed in several different aircraft, including a monoplane, seaplane, biplane, an autogiro. According to the Aircraft Engine Historical Society, there is a correspondence in the War Department files that Louis’s engine was being considered for use in the TC-14 blimp project. A few airplanes that used Louis’ engine have survived, such as a Waco ENF – the original test mule for his engine. A Granville Brothers “Gee Bee Model A” biplane is current in Oregon and once housed a Chevrolet airplane engine from Louis. Lastly, a restored Martin seaplane is hanging in the Baltimore Museum of Industry and is the only known aircraft that retains a Chevrolet engine. 1927: Louis and Arthur form the Chevrolet Brothers Manufacturing Company, but their engine proves faulty. Louis exits the venture in late 1927, leaving Arthur full ownership of the firm. 1928: Louis files articles of incorporation for the Chevrolet Aircraft Corporation (fall of 1928). 1928: Arthur changes name of the Chevrolet Brothers Manufacturing Company to the Chevrolet Aviation Motors Corporation. 1929: Arthur changes name of Chevrolet Brothers Manufacturing Company to Arthur Chevrolet Aviation Motors Corporation as a result of a legal dispute with Louis. Apparently, Louis’ contract with his partner – Glenn L. Martin – in the Chevrolet Aircraft Corporation, called for the exclusive use of the Chevrolet name. Arthur changed the name of the original company as a result of a hearing before the Indiana Secretary of State. 1929: later this year, Arthur changes the name of his company once again (a third time) to the Chevolair Motors Corporation. 1931: for reasons unknown, Glenn L. Martin changes the name of the Chevrolet Aircraft Corporation to Glenn L. Martin Motors Corporation in January 1931. Check flycorvair.com for information on using the Corvair engine in planes. Not a factory effort, but … Just sayin’. I have no affiliation with flycorvair. I did own and love a 1966 Corsa convertible. A few clarifications. The Chevrolet Brothers Manufacturing Company was founded in 1921, not 1927. Originally the company made special cylinder heads for the Model T Ford. When Ford ceased production of the Model T in 1927, the Chevrolet Brothers accelerated their development of aircraft engines. Phillips had nothing to do with the patent drawings. Glenn L. Martin sold his interest in the engine business to Phillips in 1939, nearly a decade after the blueprints were first made. Phillips did continue building Louis Chevrolet’s engine, but the onset of World War 2 curtailed that business venture. There are a few surviving examples with Phillips engine ID plates.